A breast ultrasound uses high-frequency sound waves to produce a visualisation of the breast tissue. It can be a more detailed and specific diagnostic method than a mammogram, as it can show parts of the breasts, such as the area closest to the chest wall, which are harder to image with a mammogram. Unlike x-ray or CT scan, no radiation is involved. A small handheld probe, or transducer, is passed over the surface of the breast, emitting soundwaves which create echoes that are converted into images which show the inside of your breasts on a monitor. These images allow any abnormalities or lumps to be highlighted. The process is safe, painless, and noninvasive. A doctor may recommend that you have a breast ultrasound if your mammogram shows abnormal results, or to check a breast lump to see whether it is fluid-filled (a cyst) or a solid lump, which may in turn require a biopsy. A breast ultrasound may be recommended instead of a mammogram if you are under 40, as your breast tissue may be too dense for the mammogram to accurately detect any abnormalities. In some cases, if you are over 40 and present with a breast lump, you will be advised to have both a mammogram and breast ultrasound scan. In some cases, breast ultrasound is used in conjunction with an MRI (magnetic resonance imaging) to provide a more complete picture of the area. No special preparation is required before the procedure. You will need to undress from the waist up. Breast ultrasound is available with our radiology partners and a referral is required. Please call us if you wish to set up an ultrasound appointment. 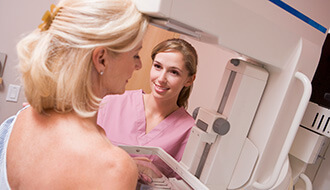 Why do I need to have a mammogram as well as an ultrasound? If you are over 40 and have a breast lump, the doctor will advise you to have both to get a full diagnostic picture of the area. There are no specific preparations required. You will need to undress from the waist up for the procedure.